Sad Cypress, first published in 1940, is a most satisfying mystery, in which Hercule Poirot discovers that almost everyone he talks to is lying. Only the doctor, Peter Lord, believes that Elinor Carlisle did not kill Mary Gerrard, her rival in love, despite the fact that it seems that only Elinor had the motive, the opportunity and the means to poison Mary with morphine hydrochloride. Peter, who is in love with Elinor, appeals to Poirot to prove that she is innocent. Sad Cypress has a clever and most complicated plot, as is usual in an Agatha Christie book, and it kept me guessing right to the end. Her portrayal of Elinor is excellent – on the surface a calm, almost detached character underneath she is in turmoil, full of repressed passion and unrequited love as it becomes obvious to her that Roddy, her fiancÃ© does not in fact love her and this leads her into actions that seem to point to her guilt. Then there are the social and cultural themes that always interest me in Agatha Christie’s books. There is the clear distinction between the classes, knowing one’s place in society shown in the relationships between Elinor and Mary, and the almost comic depiction of the two nurses, Nurse O’Brien and Nurse Hopkins, with their gossip over cups of tea. Other themes are the nature of love, and the basis for a happy marriage, the damage caused by family secrets, the ethics of euthanasia, and the difference between thinking about murder and actually committing murder. 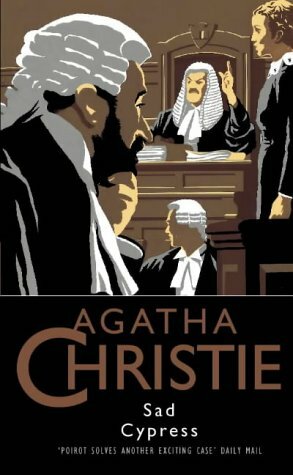 This book, if not the best of Agatha Christie’s books, is easily one of my favourites. I quoted the opening paragraph of Sad Cypress in My Friday Post earlier this month. This is the first of my books for the 10 Books of Summer 2015 Challenge. I am a big Agatha Christie. Now reading her Destination Unknown. Have added this in my list….And of course a nice review.. I think this one need to go on my reread list. There’s such a good feel to this one, I think – the village is well drawn and the human emotions are strong. Also I love a good poisoning! I too enjoyed this one, how old is your copy? Just curious if they would make it politically correct if they printed it today. Irene, my copy was published in 1993. As far as I know the book is as it was first written. Only one of her books (as far as I know) has had a title change for political correctness to ‘And Then There Were None’ and of course some of her books have different titles in the UK and the US – I don’t know why. I expect that the TV/film versions have been changed for political correctness as well as for artistic reasons. You’ve been highlighting some Chrisities I’ve not heard of, Margaret! Must get copies of these. I am so glad you liked this one, Margaret! I’ve always liked it quite a lot myself. I do like the impact of past on present, and I think Elinor Carlisle’s character is well-crafted. I also think the courtroom scenes are nicely done, with a lot of well-built tension. I remember this being unlike any of Christie’s others as it seemed to me to be almost stream-of-consciousness, plus Poirot was so late appearing. I did enjoy it though – very much. Sounds fascinating. I haven’t heard of this or watched a TV adaptation, so it would all be a surprise for me! Also well done for getting your first book for the 10 Books of Summer under your belt. I am still reading my first book.